(Bloomberg) -- BT Group Plc, Britain’s dominant phone company, is considering a deeper restructuring under new Chief Executive Officer Philip Jansen that could see its 100,000-strong workforce shrink by a quarter over five years, according to people with knowledge of the matter. BT has internally discussed a target of reducing its headcount to 75,000, partly through accelerated automation of back-office processes, some business disposals and streamlined management, said the people, who asked not to be identified because the deliberations are private. The job-cut program under consideration would go beyond a plan to eliminate 13,000 positions over three years that was announced last May. 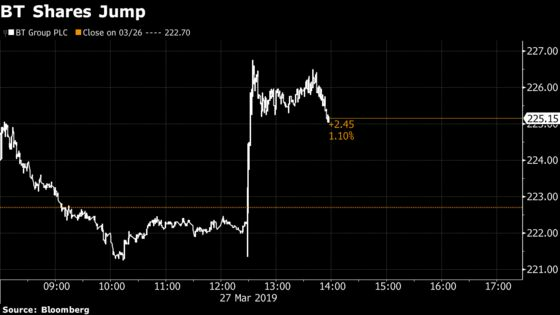 BT shares reversed a decline on the news and were up 1.6 percent as of 2:15 p.m. in London. The broader overhaul, which was discussed before Jansen took over in February, would seek to deliver annual savings of several hundred million pounds, adding to the 1.5 billion pounds ($2 billion) of cuts targeted by former CEO Gavin Patterson, the people said. London-based BT has made about a quarter of the cuts announced last year, said one of the people. The discussions are preliminary and the plans could change, and any announcement from BT wouldn’t come for several months, most likely after Jansen has outlined his vision for the company at its annual results in May, the people said. A spokesman for BT declined to comment on any new job cut targets. The phone company is an important employer in the U.K., where uncertainty about the country’s future relationship with Europe is prompting companies to scale back investment. Nissan Motor Co. said last month it’s dropping plans to build a new model in Britain, citing Brexit. Some of the world’s biggest banks have outlined plans to transfer several thousand staff from London to cities such as Paris, Dublin and Madrid. The additional savings would help BT contend with falling revenue as the government wants the company to spend more on its fixed-line network. Jansen joined BT from Worldpay Inc., after Patterson was removed following bust-ups with regulators and an Italian accounting scandal. BT shares have halved in the past three years. 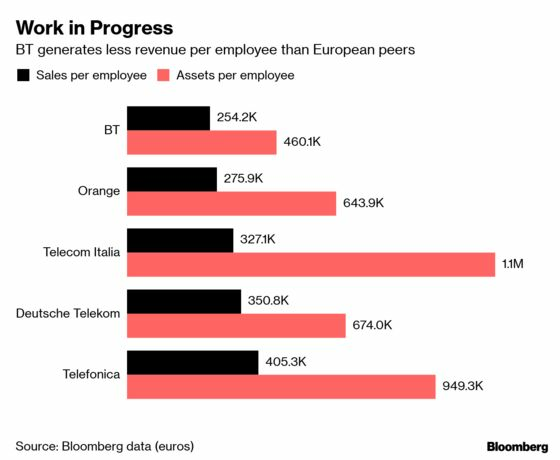 BT ranks among the least efficient of Europe’s former phone monopolies by revenue per employee, according to data compiled by Bloomberg, as peers such as Germany’s Deutsche Telekom AG have moved faster to automate some functions. Voice recognition systems are being used to interact with customers and carriers are moving toward software-defined networks that can be managed with fewer on-site engineers. Job cuts are rolling out across the sector. Last June, Deutsche Telekom said it would cut as many as 10,000 roles in its computer-services division T-Systems. In January, Belgian carrier Proximus SA announced 1,900 redundancies. More recently, Vodafone Group Plc has been meeting unions and announcing job cuts in Italy, Spain and New Zealand under new CEO Nick Read.